(12-14-2013, 09:48 PM)Pirata Nervo Wrote: [ -> ] What do you mean exactly? The url via which the shop's accessed. Can it be changed? (12-15-2013, 02:52 AM)iRocker Wrote: [ -> ] The url via which the shop's accessed. Can it be changed? upload your items there and you should be good. How do I delete an item from a user? I have iid=1 glitched on my profile (no picture, no item). I think I glitched the item when I uninstalled the plugin and reinstalled it. 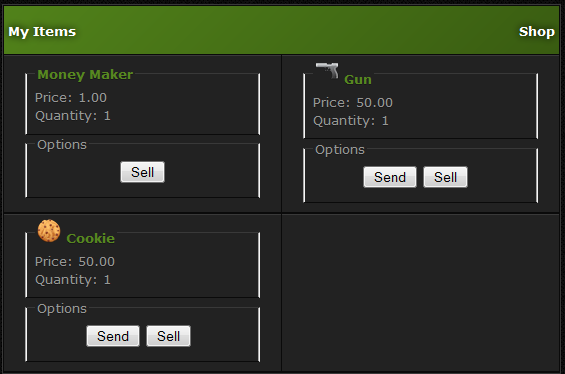 If there's no way to delete the item from a log file, or something similar then I'll replace the link (http://gtafanclub.net//images/items/money_maker.png) with a 1x1px. Go to your profile and click Edit Inventory, see if that helps. (12-15-2013, 09:14 PM)Pirata Nervo Wrote: [ -> ] Go to your profile and click Edit Inventory, see if that helps. You need to click "Edit Inventory", not the View Inventory link. (12-16-2013, 07:55 AM)Pirata Nervo Wrote: [ -> ] You need to click "Edit Inventory", not the View Inventory link. Can you give me the direct link please I edited the Plugin and deleted that line I think. I don't see the "(text)" after items. It should be near your Admin options on profile. I'm sorry if somebody already reported this, I'm just really stressed out because I'm trying to get this and it already didn't work for me one time. You uploaded to the wrong place.